We’d love your help. Let us know what’s wrong with this preview of The Forever Street by Frederic Morton. Berek, a young penniless Jew of eighteen is struggling to make a home of Turk Place, a desolate street that, in 1873 Vienna, was little more than a Gypsy encampment. But Berek believes fiercely in his own power to forge miracles. Taking the caretaker's daughter as his bride, Berek is confident he can thrive on faith. When a mysterious piece of stone comes into his possessi Berek, a young penniless Jew of eighteen is struggling to make a home of Turk Place, a desolate street that, in 1873 Vienna, was little more than a Gypsy encampment. But Berek believes fiercely in his own power to forge miracles. Taking the caretaker's daughter as his bride, Berek is confident he can thrive on faith. When a mysterious piece of stone comes into his possession, he and his wife believe their prayers have been answered; the stone may be a holy fragment of Jerusalem's Wailing Wall. 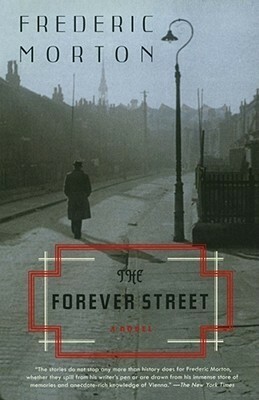 To ask other readers questions about The Forever Street, please sign up. I have a copy of this book authographed by the author. I got it on the occasion when he visited Vienna and read some pages from this book. I think still, after many years now and many books about the subject, it is one of the best books I read about the social changes that happened in Vienna during the 19th and 20th century, the upcoming nazisism in Central Europe and all the tragic consequences. I have really enjoyed Frederic Morton's books over the years, but I could not bring myself to put more time into this book and gave up after 343 pages. It just dragged on and the characters were all strange in so many ways. It was really more like South American magical realism than something European. I'll stick with Morton's non-fiction. Very interesting and nice connections in time forged between the origins of the stone, and 'Black' Mustafa (I guess he would seem 'dark' to the residents of Vienna, even 400 years after the seige, with very nice descriptions of the minarets...), the Prime Minister, and the current life of the city, again seeming to be under seige from dark forces. Definitely bears another reading next year.